Now that summer is on its way, and we can all look forward to some hot, sunny days spending more time outdoors. However, as a responsible dog owner, there are certain times and factors that you need to consider when walking your dog during the summer season, to ensure that he is safe and protected at all times. As a professional Dog Walker in the London region, where temperatures can rise quite steeply in the city, I’ve put together some hints and advice that may help to keep your dog safe and healthy. Just like humans, dogs are vulnerable to sunburn, even though you would think that their thick fur would give them some protection against the harsh rays of the sun, but this isn’t the norm. Although his thick coat will give him some shelter from the rays to some extent, his tender skin is still susceptible to burning. Areas such as the stomach or nose, that aren’t protected by fur, are in more danger of burning. Make sure that your dog doesn’t stay out in the heat of the day for too long and protect your dog’s most vulnerable areas with sun cream. 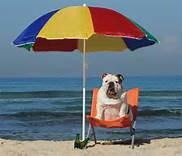 If your dog isn’t able to easily regulate his body temperature, he is more at risk of suffering from sunstroke. Dogs cannot release pent up heat through their body, by sweating as we do, but will pant rapidly to expel heat. Symptoms that your dog is suffering from sunstroke or overheating are vomiting, diarrhoea, confusion, weakness, increased salivation, hyperventilation, dry or pale gums and excessive panting. You need to take immediate action if your pet shows any of these signs. Remove your pet to a shaded area, place cool, damp towels over their body, particularly between the hind legs, armpit and the neck area. Give them sips of water, but no ice and get them to the Vet’s surgery as soon as possible. If you’re out on a walk in extreme heat, with no shade, keep a look out for your dog becoming dehydrated. He may have a dry mouth, a weak pulse, excessive urination and drooling and sunken eyes, among others. It’s advisable to always carry water for your pet when you go for a walk, giving drinks from a collapsible bowl at regular intervals. If you leave your dog at home, make sure he has access to multiple bowls of water, in shaded areas of the home and garden. When walking your dog on roads, cobbles and footpaths, take precautions during the afternoon sun, when dogs will feel the heat as they tread, with the possibility of serious burns on their paws and pads. It’s best if you can walk your dog during the early morning or late evening, when the weather is cooler and the pavements are not scorching hot. Check the pavement with the back of your hand, and if it’s too hot to touch and keep your hand there for several seconds, walk on the grass instead. During the summer season, many plants and flowers in bloom can pose a hazard if eaten by your dog. Our pets need careful supervision when walking, to make sure that they don’t chew or swallow any plants or flowers that could poison or harm them, or get stung or bitten by any insects. Your dog may suffer allergic reactions to plants or insect stings, and although symptoms may not appear immediately, its good advice to take your dog to the Vet as soon as possible. It’s at this time of the year that many parasites are multiplying, and pose a threat to your dog. Mosquitoes feed on the blood and ticks will hide in long grass, making them hard to spot when walking. Be mindful of any contact with them, as they can transmit disease and infection. I would really advise that you don’t take your dog on any car trips during the summer heat. If you do need to travel, avoid the busier times of the day and congested roads, exposing your dog to even longer periods inside the hot vehicles. Plan your journey so that you can take regular breaks to allow him time out of the car. Never leave your dog alone in the car, as temperatures can rise to fatal levels within minutes. Dogs can die in hot cars! Likewise, never leave your pet alone in the conservatory or greenhouse. If you’re at home, and want to have some cool fun with your dog, get out the hose pipe and sprinkler and let him run around in the spray. Have a blast with your dog this summer, just think cool and use your common sense. Next Article Next Article: Proud to be a Professional Member of the Pet Professional Network.